During the day of active decline from the level of 1.0863, the pair EUR / USD lost about 1.8% (190 points). There is a small recovery in the opening of today's European session; however, the negative dynamics of the pair remains. This week, the most important macro data on the United States was published. The level of consumer confidence in the US in March reached a maximum in 16 years (125.6), surpassing the forecast of economists (114.0). Annual data on US GDP and price indices for the fourth quarter, published on Thursday, also proved very positive. GDP grew in the fourth quarter on updated data by 2.1%. Today we are waiting for publication of important macroeconomic indicators for the USA, including inflation indices of personal consumption expenditure for February, from 15:30 to 17:00 (GMT + 3). However, gradually attention of investors is switching to the publication next Friday of data from the US labor market for March. GDP growth, inflation dynamics and the labor market are key factors for the Fed in determining the need for and the rate of tightening (or easing) monetary policy in the US. The US economy is recovering steadily after the crisis of 2007, and consumers are confident in the economic development of the country. Positive macro statistics coming from the US, as well as verbal intervention by the Fed representatives with regard to a further gradual increase in the interest rate in the US, contribute to the strengthening of the dollar. On the part of the key representatives of the ECB, there are statements about the need to continue to maintain extra soft monetary policy in the Eurozone. The difference in monetary policy in the US and the Eurozone will continue to be the determining factor in the medium-term dynamics of the EUR / USD pair. The pair broke through the important support levels 1.0820 (EMA200 on the daily chart), 1.0765 (EMA200 on the 1-hour chart, EMA144 on the daily chart). At the beginning of today's European session, the pair EUR / USD is trying to stabilize at support level 1.0695 (EMA200 on the 4-hour chart). Bonding above this level will mean the EUR / USD pair's return to the upward correction trend, which began in January. A further decline will mean the end of the upward correction and the EUR / USD pair's return to the downtrend with the targets of 1.0615, 1.0530, 1.0485, and 1.0350. Long positions can be considered only when the pair returns above the level of 1.0765. If the EUR / USD pair returns to the zone above the level of 1.0820, you can return to the purchases with medium-term objectives of 1.0950, 1.1000. For now, the negative background for the EUR / USD pair prevails. The new trade week that has begun is connected with important events in the world of international finance and the publication of important macroeconomic data. One of the focus of traders will be the publication on Wednesday (21:00 GMT + 3) of the protocol from the last March meeting of the FOMC, at which FOMC raised the rate by 0.25% to a level of 1.0%. Markets have already played this event; however, investors will be interested to see the text of the minutes of this meeting. As a rule, FOMC meetings discuss, among other things, a schedule for raising (or lowering) the basic interest rate. The Fed comments to the last rate increase in March indicated a two-time rate increase this year. If the FOMC protocols contain signals for the possibility of three or four rate increases, the dollar can receive significant support. Therefore, the importance of publishing this protocol and its impact on the dollar quotes is difficult to overestimate. At the same time, it is worth paying attention to the fact that in Japan, March 31 ended the fiscal year. Japanese taxpayers, including export companies, which completed the annual period of repatriation of capital to Japan, for the most part have already paid taxes. In this regard, the pressure on the yen, including the active purchases on the Japanese stock market, which occur, usually at the beginning of the new fiscal year in the first half of April, can dramatically increase. The Japanese stock index Nikkey225, which has a high correlation with the pair USD / JPY, may begin to grow actively until April 15. In this regard, it is worth being prepared for the growth of the pair USD / JPY, especially if it is accompanied by the strengthening of the US dollar in the foreign exchange market. From the news for today, we are waiting for data from the USA. At 14:00 (GMT) will be published index of gradual acceleration of inflation, as well as the index of business activity in the manufacturing sector from ISM, which is an important indicator of the state of the US economy as a whole, for March. A number of representatives of the Federal Reserve gives a speech today (scheduled for today after 14:30 GMT). The US continues to receive positive macro statistics. Recently, representatives of the Fed sound hawkish notes regarding the plan for tightening monetary policy in the US. It is likely that today will not be an exception in the rhetoric of the representatives of the Fed. And if published earlier macro data on the US will again be positive, then the dollar will receive double support today. 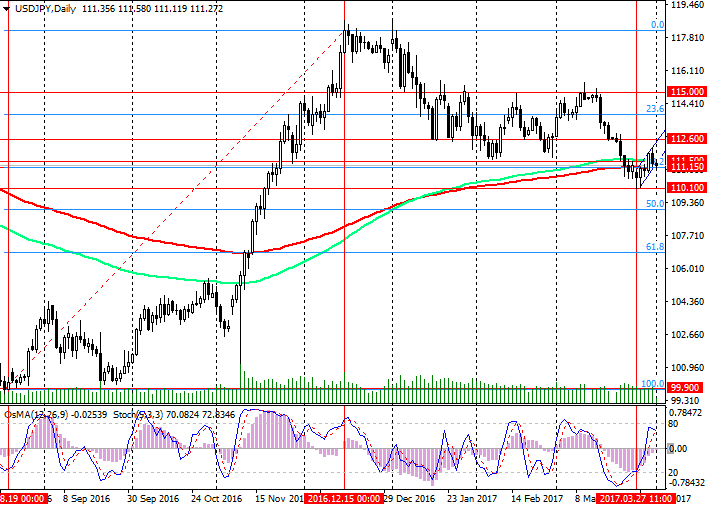 Earlier this week, the pair USD / JPY rebounded from the 110.10 support level (EMA144 on the weekly chart) and is trying to develop an upward trend, attempting to break through the short-term resistance level of 111.50 (EMA200 on the 1-hour chart). USD / JPY managed to gain a foothold above the important support level of 111.15 (EMA200 on the daily chart). The pair is growing in the rising short-term channel on the 1-hour chart and is currently near the lower border of this channel. On the daily chart, the OsMA and Stochastic indicators shifted to the buyers’ side. In case of breakdown of the resistance level 111.50, the pair USD / JPY may continue to the resistance level 112.60 (EMA200 on the 4-hour chart and the upper limit of the rising channel on the 1-hour chart). In case of consolidation of the pair USD / JPY above this level, the risks of further growth of the pair to the 115.00 level will increase. The reverse scenario is related to the breakdown of the support level at 111.15 (EMA200 on the daily chart and the Fibonacci level of 38.2% correction to the pair growth since August of last year and the level of 99.90) and the resumption of the decline. The nearest target is level 110.10. We follow the dynamics of the index of the Japanese stock market Nikkey225. The growth of the index on the background of active purchases at the beginning of the new financial year will pull the yen's sales, including in the pair USD / JPY. 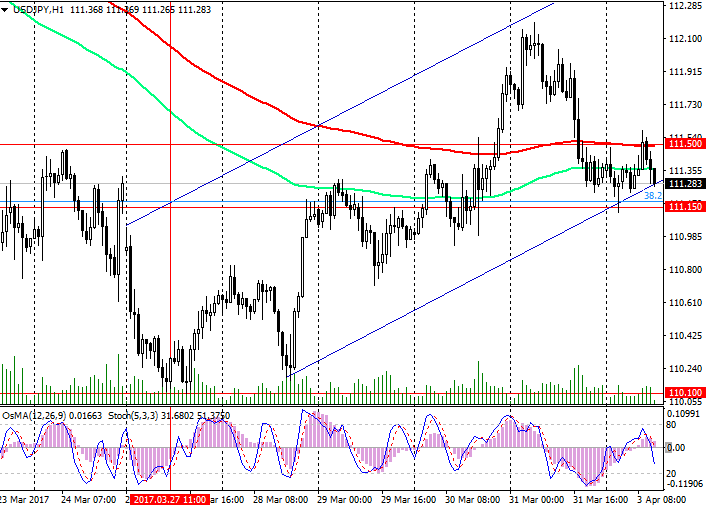 Positive dynamics of the pair USD / JPY is maintained, while the pair is above the support level of 111.15. As expected, today the RBA did not change the interest rate in Australia, leaving it at 1.5%. The RBA's accompanying statement noted that the labor market has lost momentum, and inflation may grow slower than expected. As the RBA Governor Philip Lowe noted, "some indicators of the labor market have recently weakened." Weakening consumer spending and lowering inflation, as well as the continuing sharp rise in house prices, amid weakening labor market indicators, are the main risk factors for the RBA and the Australian economy. In this regard, economists believe, the RBA will refrain from changing interest rates in the country for the time being. At this decision of the RBA, the Australian dollar reacted sharply lower, including in the pair AUD / USD. At the beginning of today's European session, the decline in the AUD / USD pair continued. The different focus of monetary policies in the US and Australia will facilitate the flow of investment funds from the Australian dollar to the US dollar and further weakening of the AUD / USD. For the first two days of the new trading month, the AUD / USD pair has already lost 0.85%. If the decline continues at the same active pace, by the end of April, the AUD / USD pair will be seen near the 0.7300 mark. However, much in the dynamics of the AUD / USD pair will also depend on the dynamics of the US dollar. Tomorrow (18:00 GMT) the protocol will be published from the last March FOMC meeting, at which the rate was raised by 0.25% to a level of 1.0%. If the FOMC protocols contain signals for the possibility of three or four rate increases, the US dollar can receive significant support in the foreign exchange market. The pair AUD / USD broke through important short-term support levels of 0.7632 (EMA200 on the 1-hour chart), 0.7622 (EMA200 on the 4-hour chart) and continues to decline to support level 0.7540 (EMA200 on the daily chart). Indicators OsMA and Stochastic on the 1-hour, 4-hour, daily, weekly charts went to the side of sellers. 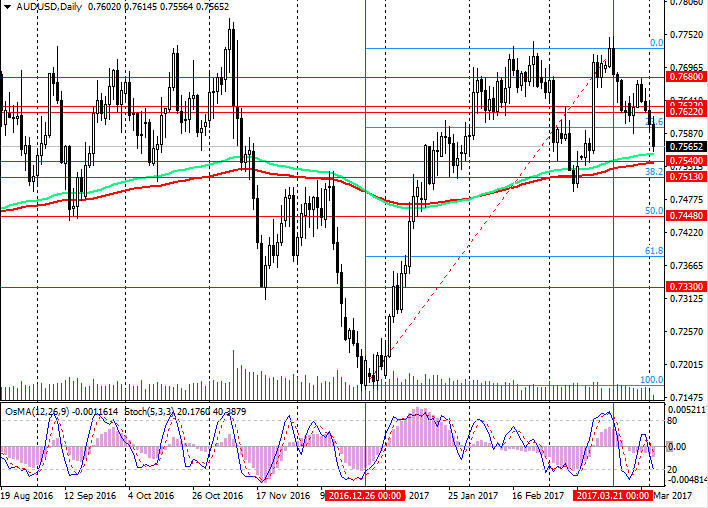 In case of deeper decline and breakdown of the support level of 0.7513 (38.2% Fibonacci level), the risks of further reduction of the AUD / USD pair will increase with a long-term target near the support level of 0.7155 (May lows, December 2016). 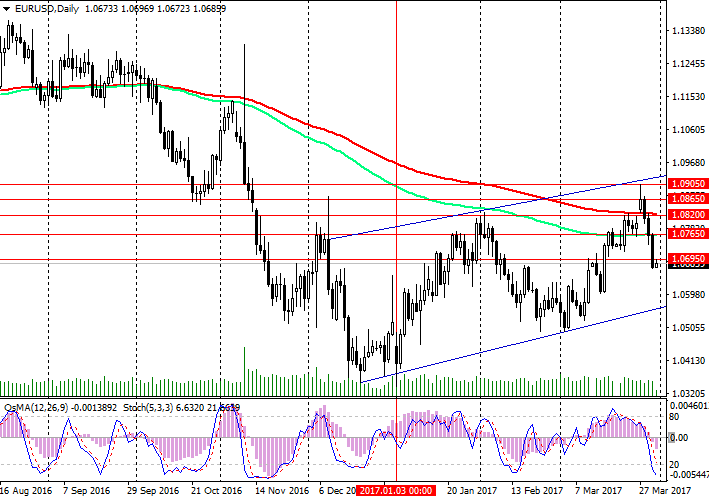 An alternative scenario for growth will become relevant in case of consolidation of the AUD / USD pair above the resistance levels 0.7622, 0.7632. Published today at 11:30 (GMT + 3), the Purchasing Managers Index (PMI) for the UK service sector for March came out at 55 (the forecast was 53.5). The publication of the index caused a sharp rise in the pound on the market. 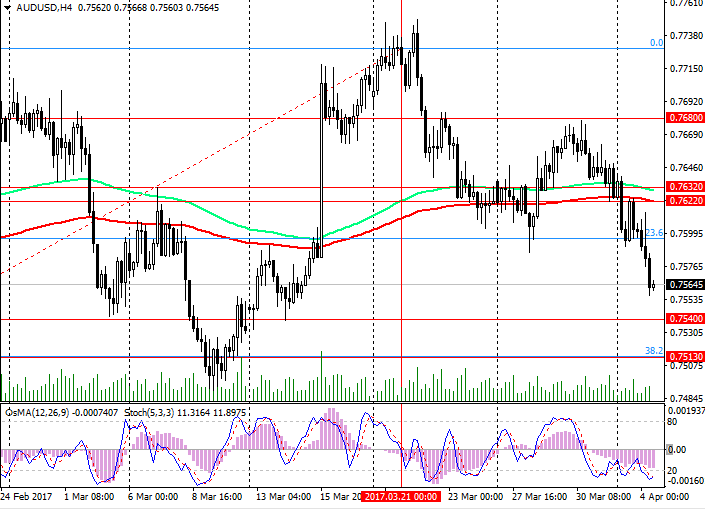 The pair GBP / USD jumped as the index was published to the level of 1.2489. Last week, a revised report on UK GDP for the fourth quarter (+ 1.9% in annual terms against + 2.0% on updated data) was presented. As a result, the pound reacted to the publication of the report on GDP decline. The two previous sessions of the GBP / USD pair were actively declining. Today's publication of the index (PMI) for the services sector may have a short-term impact on the GBP / USD pair. The pound is under pressure on the background of the beginning of negotiations on Brexit. Last week, British Prime Minister Theresa May signed a decree on the beginning of the British divorce proceedings with the European Union. The beginning of the two-year period of Brexit negotiations on the basis of Article 50 of the Lisbon Agreement is laid. Negotiations should begin within a few weeks. Nevertheless, positive macroeconomic reports from the last weeks coming from the UK indicate that the economy of the country did not collapse after the referendum on Brexit. However, the referendum hit hard on the pound's positions, which lost nearly 20% paired with the dollar to date. The pressure on the pound and the GBP / USD pair is maintained. The focus of investors' attention on Wednesday will be the publication (at 18:00 GMT) of the minutes from the March FOMC meeting, at which the Fed raised the rate by 0.25% to a level of 1.0%. If the FOMC protocols contain signals for the possibility of three or four rate increases, the dollar can receive significant support. Also worth paying attention to the publication at 13:45, 14:00 (GMT) of business activity indexes in the US services sector for March and ADP report on employment in the private sector of the US economy. Many market participants consider it a harbinger of the official report on the labor market, which is published this Friday. Therefore, the reaction to the publication of the ADP report is also expected to be high. The pound continues to remain under pressure, and the GBP / USD pair is in a long-term downtrend since July 2014. Despite the fact that positive short-term dynamics predominate, in the medium term, the pressure on the GBP / USD pair will continue as long as the pair is below resistance level 1.2600 (EMA144 on the daily chart). The indicators OsMA and Stochastic on the daily chart continue to remain on the side of sellers. If the GBP / USD pair returns to the zone below the level of 1.2465 (EMA200 on the 1-hour chart), its decline may resume. The reverse scenario is related with the growth above the level of 1.2465 and further growth to the level of 1.2600. The different focus of monetary policies in the US and the UK, the exit from the EU are powerful fundamental factors that prevent the GBP / USD pair from recovering significantly. Negative fundamental background creates prerequisites for further decline in the pair GBP / USD, the negative dynamics of the pair GBP / USD is still predominant. ECB President Mario Draghi said today that "the recovery of the Eurozone economy has intensified, it has become more homogeneous", however, "it is too early to declare success". Draghi also added that "there are no reasons to refuse current benchmarks regarding interest rates", "the revision of the ECB policy at this stage is not required." In response to a statement by Mario Draghi, the euro fell sharply in the foreign exchange market. The pair EUR / USD lost about 50 points in the moment, however, by the closing of the hour it was able to recover by half. After yesterday's publication of the minutes from the last meeting of the FOMC, which caused a violent reaction in the foreign exchange market, today there is a mixed dynamics. However, the dollar remains the favorite. The Fed, as follows from the protocol, intends to reduce its balance, amounting to 4.5 trillion dollars. The portfolio of the Federal Reserve consists of treasury bonds and mortgage securities. Reducing the balance of the Fed means selling government bonds, which will increase their profitability. Even if the Fed does not increase the rate, the Fed's portfolio reduction will cause the dollar to strengthen as the yield of US government bonds rises. Yesterday, a report from ADP was published that showed that the number of jobs in the private sector increased by 263,000 in March (the forecast was + 180,000 jobs). This suggests that the rate of hiring in the private sector in the US remained high in March, and the labor market in the US is in good shape. The presented data are extremely important, since, in some way, they can signal that on Friday a strong official report from the US Department of Labor on the state of the labor market in the country will be presented. According to the forecast, an increase in the number of new places created in the non-agricultural sector of the US economy (NFP) by 180,000 is expected (after an increase of 235,000 in February); unemployment should remain at 4.7%. The monthly increase in new jobs by more than 150,000 points confirms a stable labor market in the US. The state of the labor market, the pace and level of inflation, GDP growth are the main factors for the Fed in determining the need for tightening monetary policy in the US. If the forecast for NFP (+180 000 new jobs) is justified, then expectations of an early increase in the interest rate in the US will increase. This is a positive factor for the dollar. Conversely, a weak report on the labor market will cause a sharp weakening of the dollar. Recently, the situation is that when the weak macro data comes out, the dollar reacts much more strongly than when positive data are released. It is possible that this will happen this time too. After a sharp weakening at the end of last month, the pair EUR / USD is holding in the range between levels 1.0690, 1.0630. In view of the importance of the events of the current week in determining the future dynamics of the dollar, investors occupied, in the main, a wait-and-see attitude. The pair broke through the important levels of support 1.0765 (EMA144 on the daily chart), 1.0690 (EMA200 on the 4-hour chart). On the daily chart, the pair EUR / USD moves to the bottom line of the uplink, passing near the level of 1.0550 (November lows). If the pair EUR / USD returns to the zone above the levels of 1.0690, 1.0700 (EMA200 on the 1-hour chart), then the scenario to decline to the level of 1.0550 will be canceled, and the pair may continue to rise to the levels of 1.0765 (EMA144), 1.0820 (EMA200 on the daily chart). Indicators OsMA and Stochastics on the 1-hour, 4-hour, daily and weekly charts were deployed to short positions. Meanwhile, the negative dynamics of the EUR / USD pair is prevailing. The deficit of foreign trade in goods in the UK in February (with correction) rose to 12.5 billion pounds (forecast was 10.7 billion pounds). At the same time, the foreign trade deficit for January was revised to 12.0 billion pounds from 10.8 billion pounds. Manufacture in the manufacturing sector of the UK in February fell by another 0.1% after a decrease of 0.9% in January. The level of industrial production in annual terms in February fell to 2.8% from 3.2% in January (the forecast was + 3.7%). Such disenchanted investors data led today (08:30 GMT) by the British Office of National Statistics. In response to the data presented, the pound fell in the foreign exchange market. The pair GBP / USD lost 30 points in a moment. And the pressure on the pound and the GBP / USD pair persists. Today in the foreign exchange market as a whole, the negative background prevails after it became known about the US missile strikes against Syria. There was a sharp increase in demand for yen and precious metals. These assets act as shelters during a political or financial crisis on the world stage. 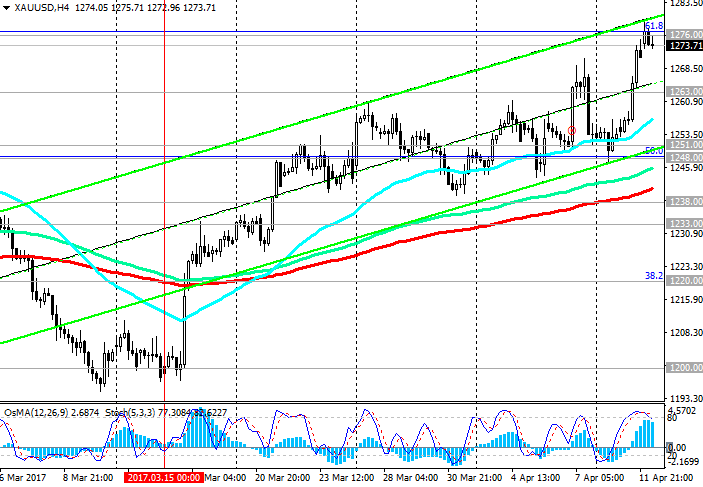 June gold futures on the basis of yesterday's trading on COMEX rose by 0.4% to 1253.30 dollars per ounce. During the Asian session, the price-spot jumped above the level of 1265.00. The pound is under pressure amid Brexit talks, when British Prime Minister Theresa May signed a decree last week to launch an official process for Britain's withdrawal from the European Union. The focus of investors today will be the meeting of US President Donald Trump with Chinese President Xi Jingping and the publication of data from the US labor market in March (12:30 GMT). According to the forecast, an increase in the number of new places created in the non-agricultural sector of the US economy (NFP) by 180,000 is expected (after an increase of 235,000 in February); unemployment should remain at 4.7%. If the average hourly earnings grow by more than 0.2% (as it was in February), the report will show a very stable labor market in the US, which will help to strengthen the positive sentiment of investors regarding the rapid rate increase in the US. This will cause the growth of the dollar. Conversely, a weak labor market report will weaken the US dollar, including in the GBP / USD pair. Starting in October, the pair GBP / USD traded mostly in the range between 1.2765 (EMA200 on the daily chart) and 1.2110. The peculiar midline of this range is the level of 1.2420. Currently, this line is the EMA50 line on the daily chart and EMA200 on the 4-hour chart. In the short term, the level of 1.2420 is a strong support level. Also on the 4-hour chart formed a tapering triangle, and the price is currently on the lower edge of the triangle. Despite the indications OsMA and Stochastic, recommending sales, the rebound from the current level is likely to follow. Short-term objectives may be the levels of 1.2470, 1.2490, through which the upper line of the converging triangle passes. In case of breakdown of the level of 1.2490, further growth of the GBP / USD pair should be expected with the nearest targets of 1.2550 (April highs), 1.2590 (EMA144 on the daily chart). A more distant goal is the level of 1.2765. If the GBP / USD pair returns to the zone below the level of 1.2420, its decline may resume. The nearest target is support level 1.2110. The different focus of monetary policies in the US and the UK, the exit from the EU are powerful fundamental factors that put pressure on the GBP / USD pair. Negative dynamics of the pair GBP / USD so far prevails. Buy Stop 1.2450. Stop-Loss 1.2390. Take-Profit 1.2470, 1.2490, 1.2550, 1.2590, 1.2700. The ambiguous US macro statistics released last week, as well as the growing geopolitical tensions in the Middle East after the US missile strike in Syria, have led to an increase in volatility in the foreign exchange market. Data on the US labor market, published last Friday, showed that the unemployment rate in March fell to 4.5%. However, the number of jobs outside the agricultural sector increased by 98,000, while economists were expecting 175,000 jobs. The dollar declined after the publication of the data, however, was able to regain its position in the foreign exchange market after the president of the Fed-New York, William Dudley, said that the Fed will begin to reduce its balance towards the end of the year. The portfolio of assets of the Federal Reserve is 4.5 billion dollars, and such actions will lead to an increase in the value of the dollar against bond sales and the growth of their yield. Dudley believes that a reduction in the Fed's portfolio will not lead to a slowdown in the rate of interest rates. Such actions of the Fed should lead to an increase in the value of the dollar and attract investors to its purchases. Many economists equate the reduction in the Fed's balance sheet to a tightening of monetary policy, and this, as a rule, leads to an increase in the value of the dollar. The pair GBP / USD hit on Friday under double pressure after the publication of disappointing data on industrial production in the UK for February. This week, market participants will follow the UK inflation data, which will be released on Tuesday (08:30 GMT). At its last meeting, the Bank of England left interest rates unchanged at 0.25%. At the same time, inflation in February reached a maximum in more than three years amid a sharp weakening of the pound (more than 20%) after the referendum for Britain's withdrawal from the EU. One member of the Monetary Policy Committee of the central bank of Great Britain voted for an immediate increase in rates. Other members also signaled the possibility of such an increase in the near future. Nevertheless, it will be difficult for the Bank of England to take such a step because of the drop in consumer spending amid a sharp weakening of the pound. Consumer spending is one of the key elements of UK GDP. From the news for today, we are waiting for the speech of Fed Chairman Janet Yellen, which will start at 20:10 (GMT). 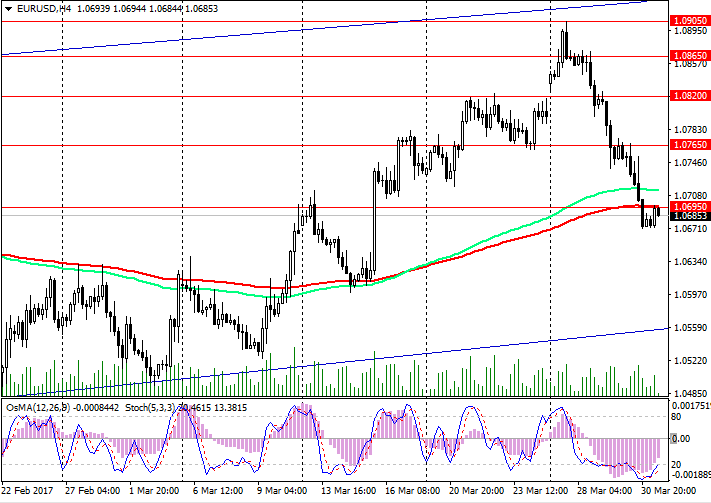 On Friday, the pair GBP / USD broke short-term support levels of 1.2450, 1.2415 (EMA200 on 1-hour and 4-hour charts). The attempt of the upward correction, undertaken by the pair today, stalled near the resistance level 1.2400. The upward correction seems to have the end ahead of time, not reaching the level of resistance 1.2415. The indicators OsMA and Stochastics on the daily and weekly charts are on the side of sellers. On the 1-hour chart, the indicators also unfold to short positions. Negative dynamics of the pair GBP / USD prevails below the level of 1.2415. Only in case of consolidation above the level of 1.2450 can we return to consideration of long positions for the pair GBP / USD. In case of breakdown at the level of 1.2490, further growth of the GBP / USD pair should be expected with the nearest targets of 1.2550 (April highs), 1.2590 (EMA144 on the daily chart). A more distant goal is the level of 1.2765. A powerful fundamental factor in favor of short positions on the GBP / USD pair is the different orientation of monetary policies in the US and UK, the exit of the country from the European Union, the official start of which was laid in April. The era of the extremely soft monetary policy of the US central bank is coming to an end. This was announced on Monday by Fed Chairman Janet Yellen, stressing that "now the Fed gives the economy the opportunity to move by inertia, measuredly." Published on Wednesday, the minutes of the March meeting of the Fed showed that the leaders of the Central Bank are inclined to start reducing the portfolio of treasury and mortgage bonds amounting to 4.5 trillion dollars. Many economists equate the reduction in the Fed's balance sheet to a tightening of monetary policy. This process, as a rule, leads to an increase in the value of the dollar. Sales of state bonds can pull up their profitability and the dollar. Janet Yellen confirmed yesterday that the interest rate in the US will reach about 3% within two years (currently the current range is 0.75% -1.00%). Janet Yellen also believes that in other developed countries, economic growth and inflation are recovering and, probably, central banks will begin to wind down stimulating programs. In this regard, it will be interesting to find out tomorrow's decision of the Bank of Canada on the interest rate, which is published at 14:00 (GMT). The current rate in Canada is 0.5%. Canada is a net exporter of oil, and oil is the country's main export commodity. The Canadian dollar, while remaining a commodity currency, is sensitive to oil quotations. The price of oil since the end of last month adjusted for 10% after the recent fall and continues to grow amid disruptions in supplies in Canada and Libya. At the same time, the Canadian dollar, which has a correlation with oil prices of 92%, since the middle of last month, practically stands still. If tomorrow the Bank of Canada only hinted at the possibility of an early increase in the interest rate in Canada, the Canadian dollar will strengthen sharply in the foreign exchange market, including in the pair USD / CAD. Conversely, the expressed tendency of the Bank of Canada to continue soft monetary policy will contribute to the weakening of the Canadian dollar. In any case, during the publication of the Bank of Canada decision on the rate, the highest volatility is expected in the Canadian dollar and USD / CAD trades. Since the middle of last month, the pair USD / CAD is trading, mainly in the range between support levels 1.3300 and resistance 1.3430. At the moment, the pair USD / CAD found support near the levels 1.3340 (EMA200 on the 4-hour chart), 1.3315 (the bottom line of the uplink on the 4-hour chart). Indicators OsMA and Stochastics do not give clear signals. A lot in the dynamics of the pair USD / CAD will depend on tomorrow's decision of the Bank of Canada on the rate and accompanying comments. If the support level breaks 1.3300, the pair USD / CAD will go to support level 1.3240 (EMA200 on the daily chart). The reverse scenario assumes a breach of the short-term resistance level of 1.3375 (EMA200 on the 1-hour chart) and further growth in the uplink on the daily chart with targets of 1.3430, 1.3590. The continuing geopolitical tensions continue to put pressure on profitable but risky assets, forcing investors to withdraw funds into safer assets - yen, government bonds, gold. June gold futures on the basis of trading on COMEX rose by 1.5% to 1,272.00 dollars per troy ounce, the highest level since early November. Quotes of gold rose to new annual and monthly highs. This year, gold prices rose by about 10%. At the beginning of the European session, the spot price for gold is near the mark of 1275.00, and prices do not seem to be going to retreat. Gold began to rise sharply after it became known about the US missile strikes in Syria at the end of last week. And now, despite the Fed's tough position to raise the interest rate and reduce its balance of $ 4.5 trillion, gold is rising in price. Gold is cheaper in the situation of an increase in the interest rate in the US, t. It is difficult for him to compete with interest-bearing assets. The cost of its acquisition and storage with a tightening of monetary policy is growing. According to some economists, gold will grow this year in price above $ 1,300 per troy ounce and to $ 1,400 in 2018. The focus of traders today will be a speech by US President Donald Trump (10:00 GMT) and the publication of the Bank of Canada's interest rate decision (14:00 GMT). A little later (15:15), the Bank of Canada's press conference will begin, and at 20:15 the speech of the head of the Bank of Canada Stephen Poloz will begin. Today, the highest volatility in the foreign exchange market is expected, especially at the above time intervals. 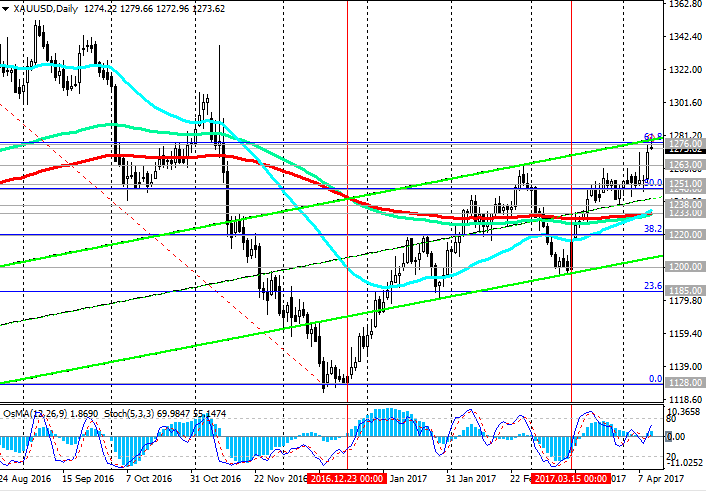 The pair XAU / USD has closely approached the upper border of the rising channel on the daily chart and the level of 1276.00 (the Fibonacci level of 61.8% correction to the wave of decline since July 2016). Since mid-March, against the background of the weakening of the dollar, the pair XAU / USD is actively growing, blocking the decline observed at the beginning of last month. The price of gold has reached the next annual maximum near the current mark. As long as the pair XAU / USD is above the support levels of 1233.00 (EMA200 on the daily chart), 1248.00 (Fibonacci level of 50.0%), it keeps positive dynamics. The indicators OsMA and Stochastics on the 4-hour, daily and weekly charts are on the buyers side. The closest target in case of breakdown of the level of 1276.00 and continuation of the growth of the pair XAU / USD will be 1300.00. The reverse scenario will be associated with breakdown of support levels of 1263.00 and further decrease to key support levels of 1248.00, 1233.00. Securing the pair XAU / USD below the level of 1220.00 (the Fibonacci level of 38.2%) will cancel the uptrend. Despite the reduction in oil reserves in the US storage facilities, oil prices fell on Wednesday. The price of Brent crude oil lost about $ 0.7 per barrel for yesterday. As reported on Wednesday by the Energy Information Administration of the US Department of Energy, crude oil and petroleum products in the US last week fell by 2.166 million barrels (forecasted to increase by 0.087 million barrels). The fall in the price of oil, which is denominated in US dollars, did not even stop the sharp decline in the dollar in the foreign exchange market. The dollar began to fall on Wednesday at the end of the US trading session after Trump told The Wall Street Journal that the dollar is becoming "too strong" and the country "is very, very difficult to compete when the dollar is strong and other countries are lowering the value of their currencies ". According to analysts of the oil market, the decline in oil prices could be due to the closure of long positions on oil and profit-taking on the eve of the holiday weekend. Tomorrow on Good Friday, trading in oil markets will not be held. Also, the rise in oil prices could stop after the release of US data, according to which the country's oil production last week reached a maximum in more than a year. Now, production in the US has grown for the eighth week in a row. Oil production in the US in March increased to 9 million barrels per day against 8.6 million barrels per day in September last year, the International Energy Agency (IEA) noted. Oil prices rose by about 20% from the end of last year after OPEC and the 11 largest oil-producing countries outside the cartel, including Russia, agreed to cut their total output by 1.8 million barrels per day for six months. Quotas are currently being observed almost 100%. Nevertheless, the active growth of oil production outside the cartel, primarily in the US, negates OPEC's efforts to contain the fall in oil prices against the backdrop of an overabundance of oil supply in the world. Since the middle of last month, rising oil prices have resumed against the backdrop of a falling dollar and interruptions in oil supplies from Libya and Canada. If the dollar begins to recover its positions in the foreign exchange market, then the fall in oil prices may resume. As predicted by the International Energy Agency (IEA), according to the monthly report, the world growth rate of oil demand in 2017 will slow for the second consecutive year. The agency predicts that oil production in the US by the end of this year will grow by 680,000 barrels per day compared with the end of 2016. Oil production outside OPEC this year could thus increase by 485,000 barrels per day. On Friday at 20:00 (GMT + 3) will be published data from the American oil service company Baker Hughes Inc. for the number of active drilling platforms in the US. It is likely that the number of active drilling rigs in the US, which has been growing since June for several months in a row and currently stands at 672 units, will grow again. And this will be another negative factor for oil prices. The number of oil drilling rigs almost doubled after reaching a minimum in May last year. The US Energy Ministry expects further growth in oil production in the country. Despite the resumption of growth since the middle of last month, the price for Brent crude is below the highs reached after the OPEC deal to cut production. The price is again in the zone of strong resistance level 55.60 (EMA200 on the weekly chart). On the weekly chart, the price is rising in the uplink, and the OsMA and Stochastic indicators are on the buyers’ side. On the daily chart, the price is on the upper boundary of the descending channel, and the indicators unfold to short positions. The picture is controversial. If the short-term 54.90 support level is broken (EMA200 on the 1-hour chart), a decline to support levels of 54.00 (EMA50 on the daily chart, as well as EMA200 and the bottom line of the uplink on the 4-hour chart), 53.00 (June and October highs) is possible. In the case of a confirmed breakdown of the support level of 50.70 (the Fibonacci retracement level of 61.8% of the correction to the decline from the level of 65.30 from June 2015 to the absolute minimums of 2016 near the 27.00 mark) and fixing below the level of 50.00, the upward trend in the price for Brent crude oil will be canceled. Update yesterday's highs near the mark of 56.80 will indicate a further increase in the price of Brent crude oil.